The following color coding is used throughout this guide to help you identify each part of the citation. See the Basic Citation Information tab below for an explanation of MLA's core information fields and more detail on each field. MLA Style directs you to use the author's last name and the page number you are referring to for your in-text citations. In many cases, your media sources will not provide an author or page numbers. If your media resource has a runtime (e.g. a movie, song, podcast, etc. ), include the range of time within the resource as hours, minutes, and seconds instead of page numbers. For example: (00:03:22-01:05:18) to specify minute 3 and 22 seconds through hour 1, minute 5, and 18 seconds. More information and examples can be found at NOVA's MLA Citation Style Guide. discussing an entire TV series, the source will be the TV series title. Ex: Name of Website where your article or video is found, Title of the TV series if you only use one episode as your source, Title of the album if you only cite one song, etc. Ex: editors, translators, actors, actresses, etc. Ex: Director's cut, 25th anniversary edition, Unabridged edition, etc. Because online works are more easily changed than print works, it is helpful to include the date that you accessed the information. This is particularly true when there is no publication date included in the resource. However, date of access is considered optional in the MLA 8th edition (53). Check your assignment or ask your professor about whether you should include dates of access in your works cited. Include as much information as you can. This may require a little digging around when you're using online media. Keep in mind that the information you provide should allow someone to locate the resource you used. You may not be able to find information to fill all of the core information categories, but include what you can find to help people access the resource in the future. Some core categories (like Title of Container) may be repeated in the citation as necessary to accurately describe where the source that you used can be found. This information may be found on a label or sign near the piece in the museum or gallery. Last Name, First Name. Title. Publication year, Name of Museum or Institution, City. Kandinsky, Vasily. Picture with an Archer. 1909, Museum of Modern Art, New York. Last Name, First Name. Title. Publication year. Name of Museum or Institution where artwork is displayed, Website URL, Date of Access. URLs should not include http:// or https:// in your citation. Your professor may ask you to omit URLs for neatness. Kandinsky, Vasily. Picture with an Archer. 1909. 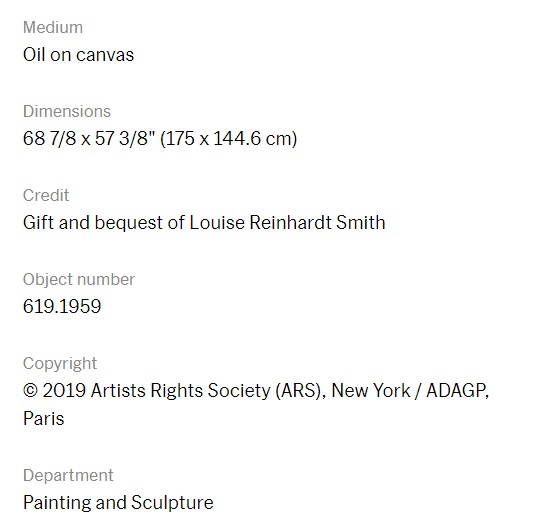 Museum of Modern Art, www.moma.org/collection/works/80104, Accessed 8 February 2019. This information should be found on the website where you viewed the artwork. Visit www.moma.org/collection/works/80104 to find this example. This information is available on the website where the image is displayed. artwork is displayed, website URL, Date of Access. Klee, Paul. Twittering Machine. 1922. Museum of Modern Art, New York. The Artchive, www.artchive.com/artchive/K/klee/twittering_machine.jpg.html. 11 February 2019.
available), website URL. Date of access. 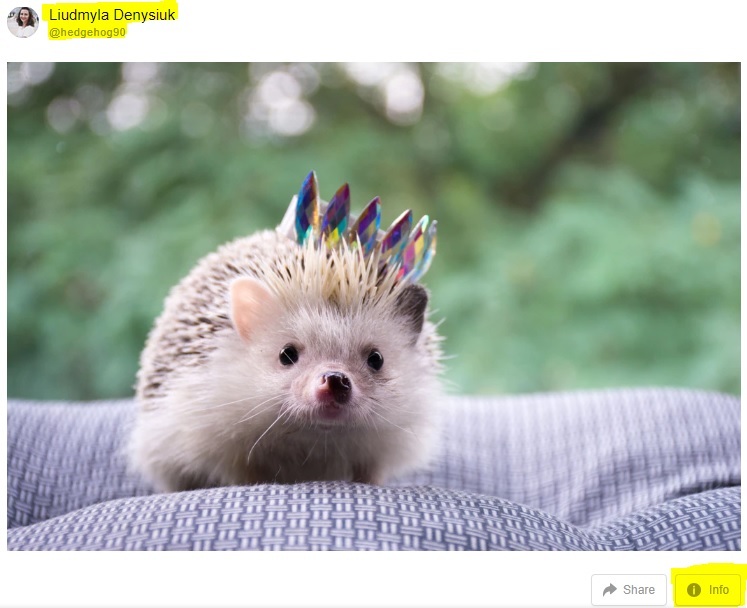 Denysiuk, Liudmyla. "Hedgie king photo." Unsplash. 14 August 2018, unsplash.com/photos/iJ9o00UeAWk. Accessed 8 February 2019. This website does not have a separate publisher, so the 'Name of Website publisher' field is omitted. This information is available on the website where the image is displayed. Additional information was revealed by clicking the 'Info' button by the image. Note: The two examples given are for the same film, but the IMDB information provides the year the film was released in theaters, while the DVD example provides the year the DVD was released. Use the year of the version of the film you saw or are referencing. Title of Film or Movie. Directed by Director, Film Studio or Distributor, release year. Star Wars: The Last Jedi. Directed by Rian Johnson, Lucasfilm, 2018. If the actor/actress is relevant to the citation, you can include them after the director. Star Wars Episode VIII: The Last Jedi. Directed by Rian Johnson, performances by Carrie Fisher and Mark Hamill, Walt Disney Pictures, 2018. The image above is a picture of the back of the case, where you can often find most of the information you need for your citation. Star Wars Episode VIII: The Last Jedi. Directed by Rian Johnson, Walt Disney Pictures, 2017. Star Wars Episode VIII: The Last Jedi. Directed by Rian Johnson, performances by Carrie Fisher and Mark Hamill, Walt Disney Pictures, 2017. The Company Credits information can be found on the film's IMDB page, beneath the Cast and other Details. Click on 'See more' to see a list of Production Companies and Distributors (see example below). www.imdb.com/title/tt2527336/?ref_=nv_sr_1. Accessed 26 February, 2019. "Episode Title." Name of TV Show, Network Name, TV Station Call Letters, City, air date. "The Outspoken King." Empire, Fox, WTTG, Washington, D.C., 14 Jan 2015. Most of this information can be found in the episode credits. You may also be able to find this information on IMDB, the DVD or Blu-ray case, Wikipedia, or the website of the TV network that aired the show. Make sure you verify information at another source if you find it on Wikipedia. "Episode Title." Name of TV Show, written by Writer Name, directed by Director Name, Distributor, release year. "The Lion and the Rose." Game of Thrones Season 4, written by George R. R. Martin, directed by Alex Graves, Home Box Office (HBO), 2014. Most services will include the Episode Title, Name of TV Show, Season number, and Episode number. You may also find information in the episode credits. You may need to check a second source for the Network Name and air date. Make sure you verify information at another source if you find it on Wikipedia. "Episode Title." Name of TV Show, season number, episode number, Network Name, air date. Streaming Channel, website url. "The Outspoken King." Empire, season 1, episode 2, Fox, 14 Jan 2015. Hulu, www.hulu.com/watch/742916ba-486a-42cb-9066-bb592b2b1214. Producers. Title of TV show. Distributor, year. Benioff, David and D.B. Weiss. Game of Thrones. Home Box Office (HBO), 2011-. “Video Title.” Name of site, uploaded by username, date uploaded, url. “What if You Stopped Sleeping?” YouTube, uploaded by AsapSCIENCE, 22 Sep. 2013, youtu.be/nNhDkKAvxFk. Note: If the creator is different from the uploader, cite the creator before the video title. Ex: Author Name. or Username. "Video Title." Name of site, uploaded by username, date uploaded, url. In this example, the creator/author and the uploader are the same, so only the uploader is listed in the citation. If the creator is different from the uploader, cite the creator before the video title. Artist. “Song Title.” Album, Record Label, publication date. Streaming Website, URL to the song. Rammstein. “Sonne.” Mutter, Universal Music GmbH, 2001. Spotify, open.spotify.com/album/7ikuEzL6xeAgu6yT6YVLy7. Artist. "Song Title." Album, Record Label, publication date. Streaming Website, URL to the song. Childish Gambino. “This is America.” This is America, RCA Records, 2018. Spotify, open.spotify.com/album/7arx9qPJexCsDz67El4qvk. Because this song was released as a single, it does not have a separate Album title. Check with your professor to see if they would prefer you omit the Album title when you cite singles. Artist. “Song Title.” Album, Record Label, publication date. May, Daniel. “Earth.” Feng Shui: Music for Balanced Living, Avalon Music, 2002. The publication date was listed on the CD itself, near the center. Narrator/Host. “Episode Title.” Podcast Series Title, season/series number, episode number, Publisher, publication date, URL. If a podcast does not use season/series numbers or episode numbers you do not need to include anything in that field. Gladwell, Malcolm, narrator. “The Lady Vanishes.” Revisionist History, season 1, episode 1, Slate Group, 2016, revisionisthistory.com/seasons?selected=season-1. Narrator/Host. “Episode Title.” Podcast Series Title, season/series number, episode number, Publisher, publication date, Container website, URL. This podcast does not use season/series numbers or episode numbers, so they are not included in the example below. Narrator/Host. “Episode Title.” Podcast Series Title, season/series number, episode number, Container app, publication date. Gladwell, Malcolm, narrator. “The Lady Vanishes.” Revisionist History, iTunes app, 16 June 2016. Author's Last Name, First Name. or Account Name. Brief Description of Post. Site name, publication date, post time, URL. www.facebook.com/insidenova/posts/10156121779360819. Accessed 15 February, 2019. This information should be found on the social media site near/on the post you are citing. Note: You can find the time of a Facebook post by hovering your mouse over the date (found beneath the account name). Remember: You are citing the Facebook post, not the linked article. The Title of your source is a Brief Description of the Post or a snippet of the text of the post, not the title of the linked article. If you mean to cite the article, click the link and cite the article on the site where it was originally posted. Note: For Tweets, use @username for the author. For example, @GeorgeTakei. Account Name. "Brief Description of Post." Site name, publication date, post time, URL. @NOVAcommcollege. "Make sure to file your taxes!" Twitter, 21 Feb. 2019, 9:55 a.m., twitter.com/NOVAcommcollege/status/1098642447784181760. 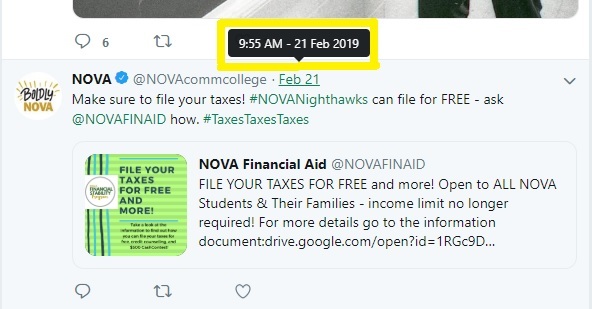 From the Twitter feed, hover over the date to find the time of the post (see image on the right) or click on the tweet to open it and find the date and time there. Author’s name or Username. “Post Title.” Site Name, Publisher’s or Sponsor’s Name, URL. www.celebitchy.com/603221/steph_curry_wonders_if_american_astronauts_ever_made_it_to_the_moon/. Accessed 13 Dec. 2018. You will often find this information at the beginning or the end of the post. Remember to include the date you accessed the post if it is a source that can be edited or changed. This information was located at the beginning of the post, grouped together with the title. In some cases an author or date or other core information may not be provided. In those cases it is especially important to include a date of access. Author’s Name. “Re: Subject Line.” Received by recipient’s name, Date message was sent. Jacobson, Helen. “Re: Information Literacy Framework Case Studies - Chapter Proposal.” Received by Monique Clark, 29 Aug. 2018. Author’s Last Name, First Name or Name of Organization. “Document Title.” Sponsor or Publisher (if available), publication date. File type. Clark, Monique. “Citing Media in MLA 8th Format.” 2018. Microsoft Word file. Note: If you’re citing a document found online, put a comma after the publication date and include the URL to the file. "MLA Citation Style Guide." NOVA Libraries, 2018, libguides.nvcc.edu/MLACitationStyle. "The MLA Style Center." Modern Language Association of America, 2019, style.mla.org. Why don't the citations above have authors listed? When the author and publisher of a work are the same, begin the entry with the title, skipping the author element, and list the organization only as publisher (MLA Handbook, 25).